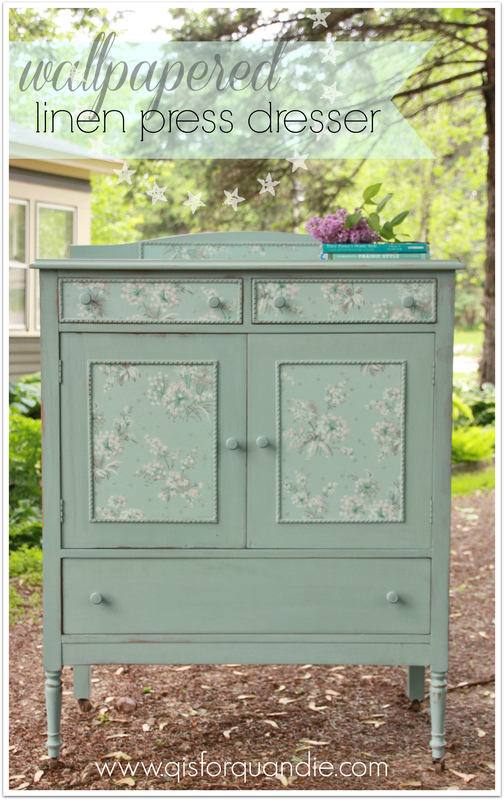 Is it possible to be in love with a dresser? Because I think I am in love with this one. I know, I’ve said it before. And I’ll probably say it again, but this is one of my all time favs. 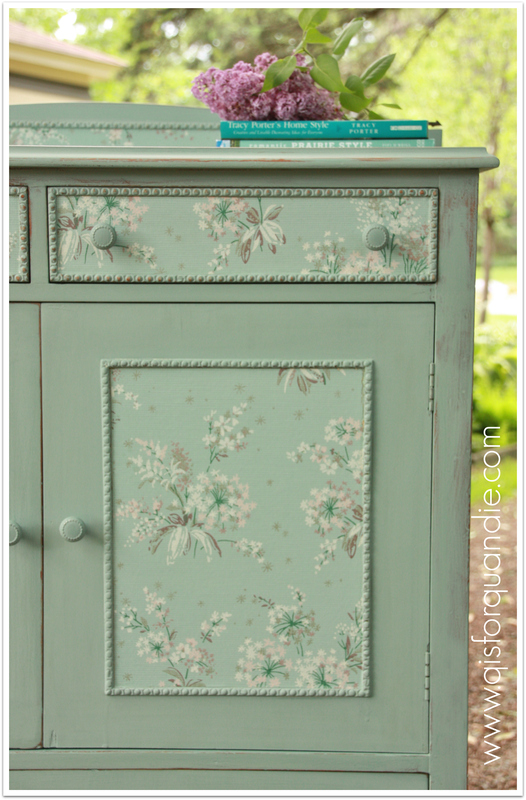 I’ve wanted to try using vintage wallpaper on a dresser for a while. You’ll remember that I purchased some from my new friend Michelle at Junk Bonanza. There it is, in the back on the right. I also purchased the Annie Sloan Duck Egg paint at the same time. All I needed was the perfect piece of furniture to use it on. And I found it. A lovely linen press dresser. This was one of those pieces that was actually in decent shape to begin with, although it had some damage on one of the inside drawers. I knew that the areas framed in with trim would be perfect for the wallpaper. My process on this dresser in a nutshell was this. 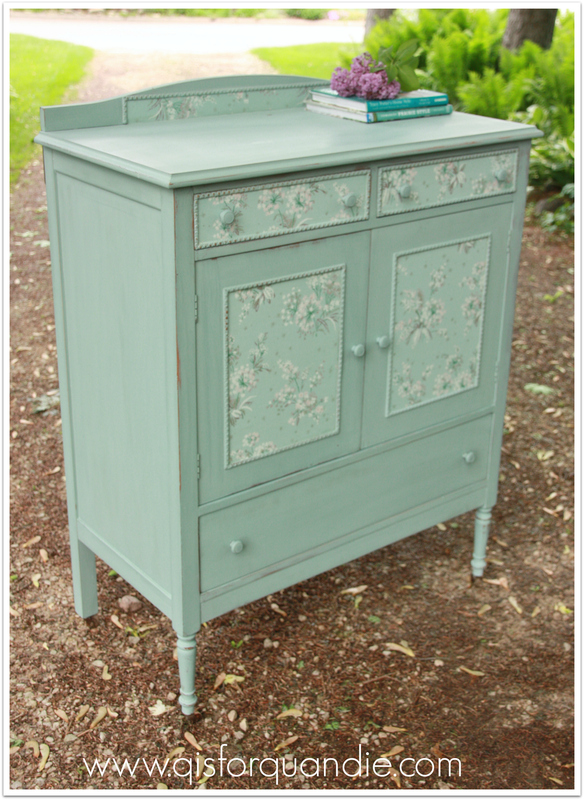 I painted the entire thing with the Annie Sloan paint in Duck Egg. Then, I used wallpaper paste to adhere the wallpaper. It was slightly frail, and back in the day wallpaper was not pre-pasted. I went back to my former wallpapering days and followed the same rules. I ‘booked’ my wallpaper by spreading it with wallpaper paste and gently folding the piece in half, pasted sides together. I waited a couple of minutes and then opened it back up and applied it to the dresser. I smoothed out any bubbles and excess paste, trimmed around the edges with a razor blade, and cleaned off excess paste that had oozed out. Once the wallpaper was dry, I waxed the painted portions of the dresser. I did not wax the wallpaper. I don’t think wax and vintage wallpaper would have mixed well. What makes this dresser a linen press are the drawers inside that were intended for storing linens. I added some label holders to the drawers. They currently just have some of the vintage wallpaper in them, but one could change that to paper labels that show the contents of each drawer. 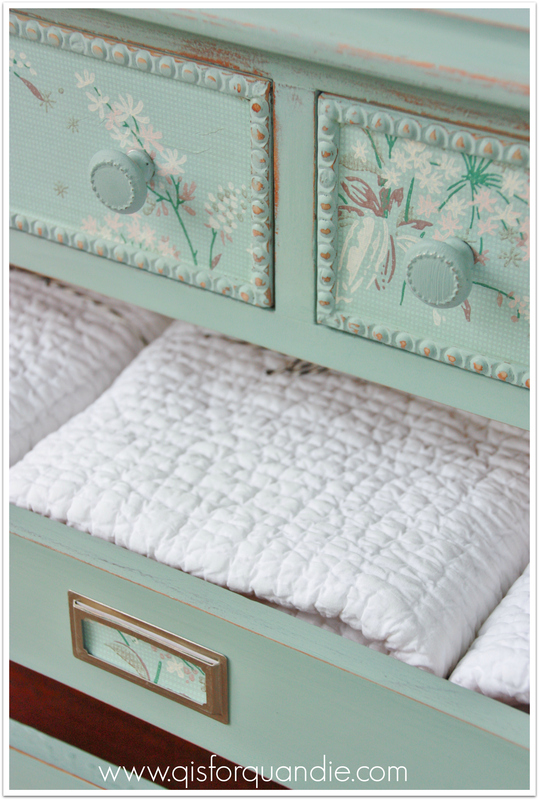 Imagine how pretty it would be to have all of your linens neatly stored inside this dresser. 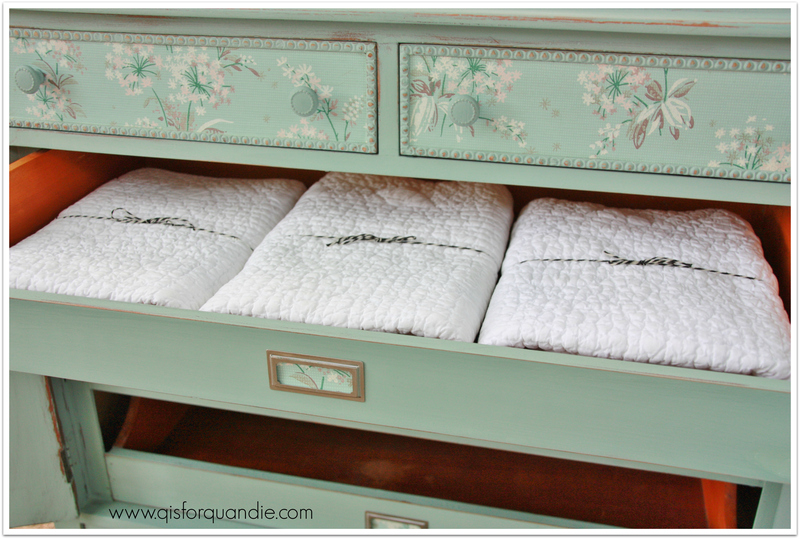 I staged the drawer with some white quilted Euro pillow shams that will be available at my sale. I have to tell you, it was ridiculously windy when I was trying to take these pictures. The doors kept blowing closed. 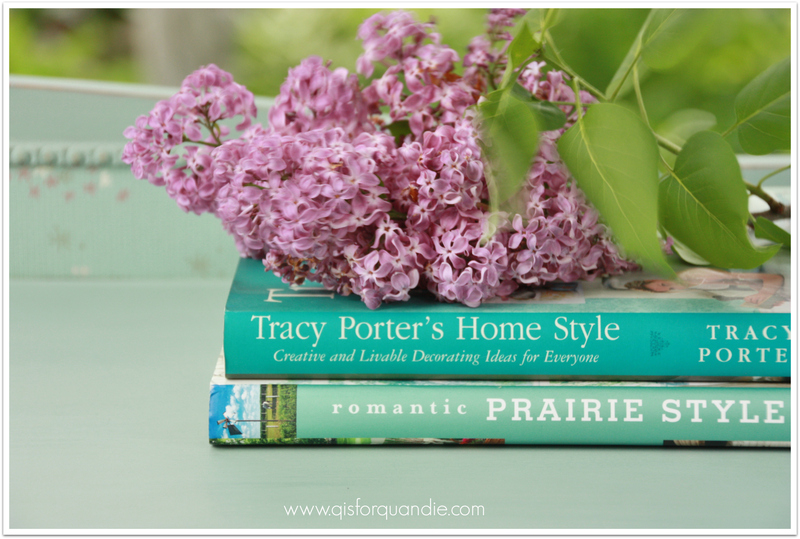 The lilac on top was fluttering madly. Seeds kept falling out of the trees onto the top of the dresser. It was pure madness I tell you! You can see the movement in the lilac in this next photo. I once again painted the original knobs on this piece. I had planned to change them out for glass knobs, but because of those interior drawers, I couldn’t have the screws on the glass knobs sticking out on the back side of the doors. I could have cut the screws off, and counter-sunk the nuts, but that would have been quite a job. I decided to just keep the originals instead. Although you see casters on this dresser in the pictures, in the end I had to take them off. They weren’t very sturdy, they kept falling out, and one broke off after the photo shoot! Luckily I was able to repair the leg, but I wouldn’t recommend using casters on this piece. In fact, I am learning to remove the casters from any older pieces that have slender legs like this one. I love the look of the casters, but the reality is that they usually aren’t strong enough to handle rolling the dresser around on them. And people are tempted to do just that if they are there. I am warning all of you now, don’t roll your vintage dresser around on its antique casters. You are inviting disaster. So there it is, my vintage wallpapered linen press dresser. This will be available at the Carriage House Sale! Great job!…again. The wall paper really set this off and makes it unique. I would love to purchase this, would you contact me? I’m in love with it! I’m sending you an email Kristy! Thanks Annie! The wallpaper really makes it. Can you say “sweet” in exaggerated tones? This would be darling in a nursery! Love the addition of the wallpaper that was brilliant! Color is one of my favs but I am so glad you just painted the original hardware on this one. The whole thing is perfect! I had that same thought … about the nursery … brilliant minds, we seem to think alike often. GORGEOUS! I love the color and the wallpaper and am inspired. 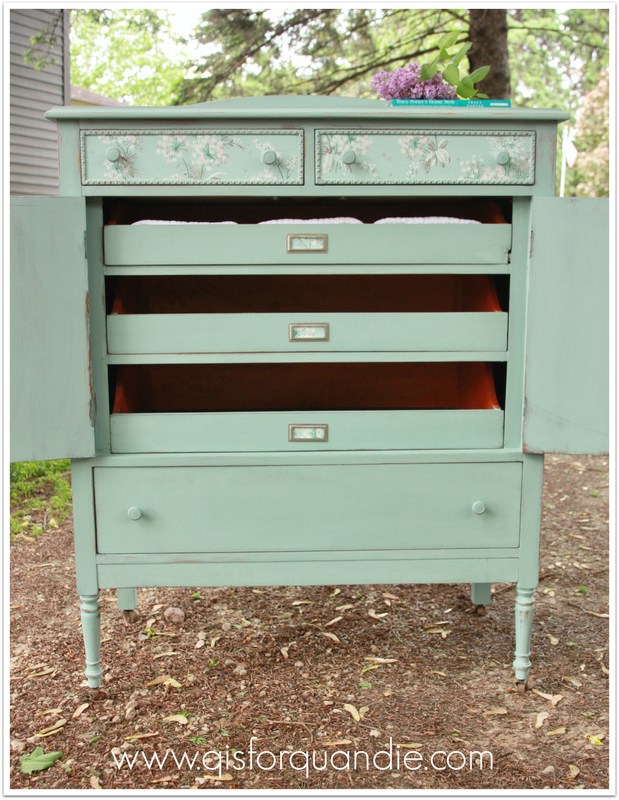 I did a similar piece this week too with the same kind of drawers. I have been known to fall in love with a piece of furniture too (most recently my chippy Apron Strings dresser). Your Apron Strings is a gorgeous dresser! I always see that color on other people’s things and love it, but I didn’t like it as well on the things I put it on. I may have to give it another try one of these days. Great job on this one Linda – love the use of the wallpaper – genius! Are you having fun at work today without me? Hope you aren’t getting too many calls about that water line being off. Thanks Barbara! I’m busy getting things organized in the Carriage House this weekend. I have lots of fab stuff this year! And I know my friend Sue will bring a pile of even better stuff. I love when she brings her stuff over, it’s like Christmas for me, unboxing it all. Of course, I don’t get to keep it, but I love just seeing what she has. I have done plenty of low dressers too … I just work with whatever I happen to find. beautiful. just simple and beautiful. Thanks Karen. I think I’ll have to do another wallpapered piece soon! This is another all time favorite of mine, too. This color goes with some many others and I can just see it in a room with the sun coming in. One of your best ever! This is getting “pinned” right away on my board. You are so creative! That reminds me, I should pin this myself! Thanks Barb! This is a beautiful dresser. I would have to say this is my all time favorite of all the dresser I’ve seen lately. You do amazing work, I only wish I lived closer so I could attend your sale. Thanks so much Vanessa, I really appreciate your kind comment! Oh, my goodness!! That is SO cute!! I wish I could find stuff like this! I’m so glad I added you to my list of blogs to follow! This piece, along with some many other creations of yours is so beautiful! I love the touch of the name plates on the interior drawers. Brilliant! The wallpaper really adds to this piece and the color is perfect with the paper. Love everything you did with this one. The label holders are a nice touch too. Great job! Another piece with a new life. Yay! Love this. What a beautiful piece! There are so many wonderful things about this piece! First I love how you painted it and added the wallpaper–it was definitely perfect for it. 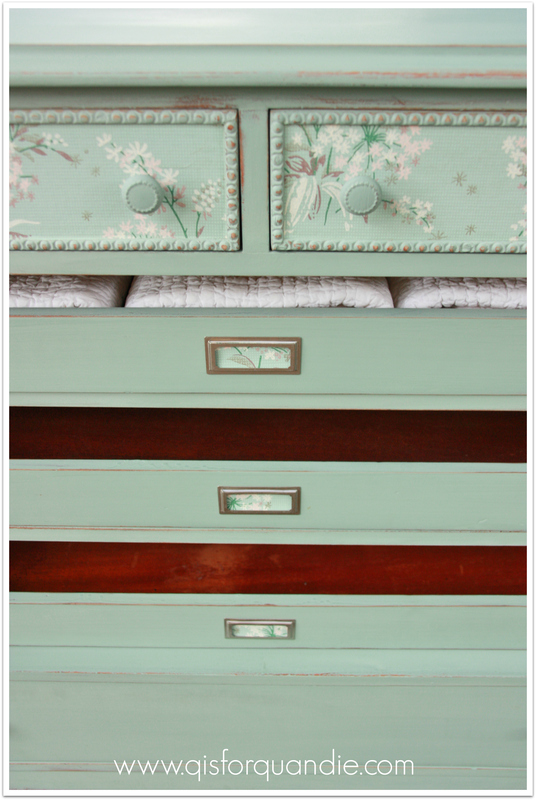 Second, I love the piece itself with the linen drawers. I have never seen that and it is brilliant! Thanks Susan! I’ve painted a few of these linen press dressers with those interior drawers, and I only recently discovered that they were originally intended for linens. I love the idea of using furniture for storing linens instead of a linen closet in the hallway. I can see why you’d consider falling in love with this piece. Beautiful! Beautiful piece, can you purchase the paint in Canada, if do where? Thanks Debbie! 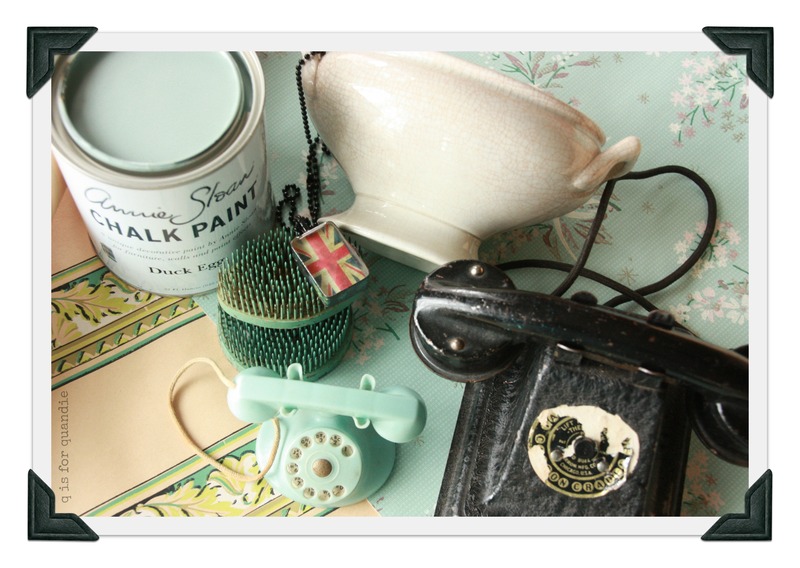 Just google (or however you choose to search) ‘Annie Sloan stockists in Canada’. It looks like there are quite a few. Hopefully you can find one near you. Omg! I just started to paint and I was looking for ideas. This piece is absolutely beautiful and unique. As soon as I get some experience, I’m going to attempt something like this. Thank you so much for posting the pictures. Your work is truly gorgeous. You are welcome Pina! Thanks for your kind comment! This is stunning! Lovely piece beautifully made over. Great work!! You did an amazing job. I look forward to following your future projects. I too will back you on the wheels on these slender legs. I did a very similar piece and sold it to a photo studio, she was rolling it down the sidewalk with a friend, hit a crack and pushed it. Sure enough it snapped the leg….I was heart broken to hear that it took 5 days to create:) Even if just for display try not and roll these on there wheels. They are more of a decoration than functional after all these years!! Keep up the good work. Thanks Daniella! Yeah, I think a lot of people are tempted into thinking those casters are meant to be functional. Maybe at one time they were, when the piece was new, but not anymore. My new policy is to remove them for safety’s sake! Lovely. I like how you wallpapered the inside drawer fronts, and even lined up the pattern. Nice! Thank you so much. I love this work it is so much fun. I couldn’t ask for a better job. 16 years now…..feeling like I am getting a little old when it comes to the lifting. I look forward to new posts and projects you do. You are extremely talented!! Thanks Danielle! I enjoy it tremendously as well. There is just something about revamping a piece and giving it a new life that I can’t get enough of. I too worry that I won’t be able to sling furniture around one day, but hopefully not anytime soon! I found you over at Silver Pennies Sundays today and I’m in love with everything you paint! Wow! I will be spending some time pinning for sure. Hi Patti! Somehow your comment ended up in my spam folder. But I found you there and retrieved you, so all is good now. Thanks for your very flattering comment 🙂 I hope you’ll stick around for a while!